Helping your child learn and master new skills is great for their confidence and self-esteem. A child who knows how to swim and is confident in the water is far less likely to encounter trouble when the family is near a body of water, such as a pool, beach, lake, or even a whirlpool! Knowing how to swim also makes watersports and boating much safer. PJCC swim lessons are taught in stages, so with each round a child learns new skills and as they master each skill, they swim away with feelings of pride and accomplishment. Success always boosts a child’s self-confidence and makes them eager to take on additional challenges… all good preparation for the rigors of adult life! Did you know that the PJCC offers lessons for adults? If you’re interested in learning to swim or in advancing your swimming skills, check out our beginner and intermediate classes for adults only. 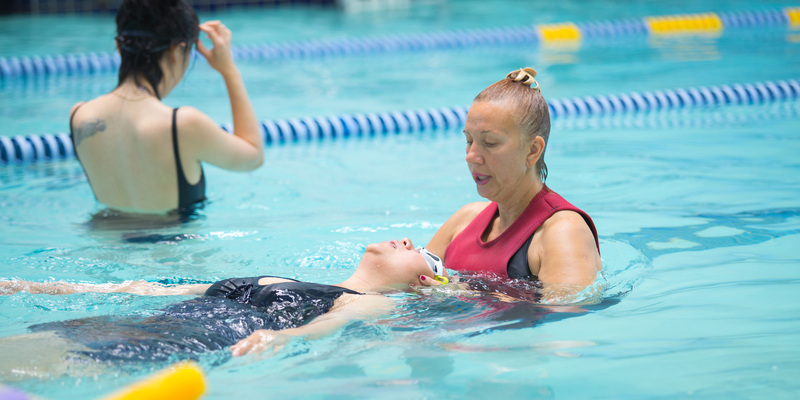 These classes have been developed to accommodate participants in a low student-to-teacher ratio where adults can have a say in what they are looking to achieve from their swim lessons. Sign up now and learn to swim in time for summer! Are you a swimmer with a good foundation? Don’t miss this once-a-week opportunity to polish your skills and get some on deck coaching from Coach Curt. Svetlana specializes in teaching children and adults, from basic aquatic skills to advanced swimming techniques. For almost three years, she’s been teaching water babies and water wigglers how to conquer their fears of the water. She also teaches our adult swim preparation class. “Swim lessons create new possibilities for children and adults,” she says. “It makes happy to help my students reach their swim goals.” Feel free to stop and say hello the next time you see Svetlana. With warm weather right around the corner, please don’t forget these important rules. If your child is going to be spending a prolonged time in the water, please have him/her wear water shoes to protect their tender soles. Children under the age of 7 years old must always be accompanied by an adult, including before and after classes. Suit up, because this means we need you in the water with them! Only “U.S. Coast Guard-approved” flotation devices are allowed. For your convenience, we have several acceptable “puddle jumpers” available for use. These can be found on the indoor pool deck, free of charge. Filling out a form in person at the Aquatics Office. Sending an email clearly stating the month in which you would like to cancel. All emails must be sent to aquatics@pjcc.org. Missed Classes: We do not offer make up classes for missed classes. In some cases, we will honor a doctor’s note if the child was seen by a physician and make arrangements for a swim lesson credit. Not sure of your class level? Our swim instructors will meet with your child in the water to assess their swim proficiency and place them in the appropriate level. To schedule your free evaluation, call our Aquatics Office today at 650.378.2782! Interested in becoming part of the Aquatics team? We’re looking for dedicated staff to lifeguard, teach swim lessons, and coach our Barracuda youth swim team. No experience is necessary, and we will provide the certification training. Positions include free PJCC Center Membership as well as additional swim lesson and Center benefits and discounts. Learn more by contacting Aquatics Manager, Courtney Smith.